An emergency radio can help save you and your family during times of crisis and also keep you entertained. If you are looking for the best emergency radio, then we can help you with that. We have made a list of some of the best emergency radios available in the market and we would also discuss their features in greater detail. It’s essential you do a little research before you go out to buy a radio for yourself. You want a device that not only provides you with alerts and warnings, but also has several extra features that can help you survive a disaster. Although you can find all kinds of radios in the market, there are certain brands that have established their reputation as the manufacturers of the most convenient and reliable emergency radios. We are going to look into these brands as well because investing in one of their products would be a wise decision. 3.3 What Power Options​ Do You Want? Kaito KA500 can be powered via 6 Ways. 7 Pre-programmed NOAA weather channels & 24/7 real-time weather forecast. Built-in standard DC 5V USB output port for charging electronic devices. Telescopic antenna extends up to 14.5" for high sensitivity reception. 7 NOOA Channels & Receives weather alerts directly from the National Weather Service. Comes with an alarm clock, power backup and an external antenna. Programmed with over 60+ alerts like hurricanes & flash flooding. Charge with 3 different options - USB, Solar and Hand crank. Public Alert Certified Radio alerts you of severe weather warnings. Adjustable LED flashlight & Built-in speaker, clock. Stereo headphone output & 90-minute auto shut-off. AM/FM/NOAA Weather Radio & 140 Lumen Flashlight. Easily charged through 3 ways: Micro & Standard USB Ports, Solar Panel and Kinetic hand crank. Durable, Water Resistant and durable enough to fit in your pocket. AM/FM NOAA Weather Alert Crank Radio. Audible siren activates when alerts are received. Can be charged in 3 Ways: Hand Crank, USB, or Solar Panel. Large bright Backlit LCD with Digital Clock. While you are stuck in your home during a tornado or a snowstorm without any news of what’s going on outside, or there is a fire nearby and you need to know if it’s safe to go out, then a good emergency radio can really come in handy. An emergency radio can save your life even when the power is out. Different models have unique features that can help you through a tough situation. If you are looking for a good emergency radio, then read on as we discuss the features of some of the best emergency radios on the market in the emergency radio reviews below. ​Do you need a good radio for emergencies? Then you should definitely check out the Kaito KA500. This radio comes with a high quality AC generator and a solar panel that keeps the batteries charged. What’s more is that this radio has a LED lamp that can be used as a torch during the poorly lit conditions. A LED light on the side can be used as a signal in case of emergencies. Worried how you would charge your phone during a power failure? The Kaito KA500 has you covered. This radio can charge a number of small electronic devices. The weather alert feature is especially useful and can warn you in case of a disaster. With a pretty good reception and designed to provide stable reception, the Kaito KA500 can be a real lifesaver. The Midland WR-120 is the perfect radio for people who live in high risk areas. The radio displays weather alerts and warnings in three different languages. The seven NOAA channels cover almost 93% of USA so you would be well covered no matter where you live. The SAME (Specific Area Message Encoding) feature in this radio is particularly useful. This feature sounds an alarm only when there is a threat in a specific location and blocks out warning signals for faraway areas. This Midland weather radio has a memory that can save up to 25 countries, which allows you to monitor channels from various areas and also give you an option to restrict it to only one. The radio also comes with an alarm clock, power backup and an external antenna. With a one year warranty and these incredible features, the Midland WR-120 is something that can really help you out. 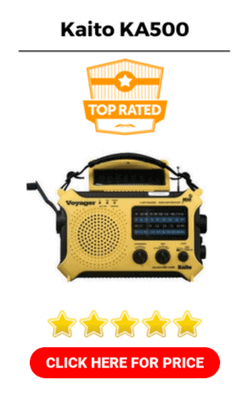 If you are looking for the best weather radio this is an excellent choice. Another great emergency radio is the Sangean MMR-88. This radio also has a phone charger and a LED flashlight that can help you give signals in Morse code. With an 850mAh Lithium-ion, you can not only charge this radio by hand cranking, but through a solar panel and a USB jack as well. This allows you to keep your radio charged at all times. It doesn’t matter if you are in a high risk area, or holed up in your basement during a tornado, the Sangean MMR-88 lets you hear news, music and radio programs while also providing you with weather alerts and warnings. The additional features include a flashlight and an emergency buzzer. This radio is not only versatile with a lot of amazing features, but is also user-friendly. If you are thinking about buying an emergency radio with numerous useful features, then you should also check out the Esky Solar Hand Crank Radio. This device not only acts as a radio, but also as a LED light and a battery charger. You can use this radio as a flashlight when power is out, and also charge your phone and other small electronic devices. You can charge this radio by hand cranking, solar power or a USB jack. Not only can you hear news and alerts through your Esky radio during emergencies but you can also listen to music in daily life. This lightweight radio is easy to carry and can help you survive a storm. With a good warranty, and some really cool features, the Esky radio is a must-have. Another contender for the best emergency radio is the Midland ER310. 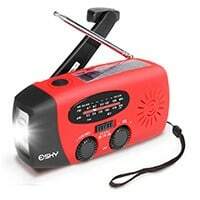 With a hand crank charger this radio is perfect for both daily use and during severe weather conditions. The NOAA receiver features seven channels and brings you news, alerts and emergency messages from all seven channels. You are notified by a loud siren when you receive an alert. The radio also lets you enjoys different radio stations and you can connect headphones to listen to the radio privately. With the 2600mAh Rechargeable Lithium Ion battery the Midland ER310 can last for 32 hours and can be recharged through solar power, hand crank or a USB cable. With all these amazing features, the Midland ER310 can prove to be really helpful to keep you and your family safe during an emergency. When you head out to buy an emergency radio, there are certain things that you need to consider before you invest in one. You don’t want to waste your money on a device that doesn’t cover all the specs you need. So don’t make a hasty decision, do a little research before you buy a new device. Some important questions you should ask and features that you need to check in an emergency radio are covered in this section. This guide can help you choose the perfect radio for emergency situations. The first question you need to ask yourself is; what type of radio do you need? Most emergency radios are designed to provide news and alerts and do not support two-way communication. So if you want a radio that would allow you to communicate with authorities and also provides you alerts, you should invest on a more expensive device that has all these features. If your requirement only includes receiving valuable information during times of crisis then just about any emergency radio would do. The second important question you need to answer before buying a radio is what kind of reception you would need. If you want a really good reception you can also buy a separate antenna to make your radio work better. Or you can look for a radio which provides excellent reception. A radio that comes with the NOAA logo assures that you would receive alerts and news from the National Oceanic and Atmospheric Administration. So you should check for this logo on your device before buying it. Even without very good reception, a radio that accepts alarms from NOAA would keep you covered during natural disasters and severe weather conditions. What Power Options​ Do You Want? While buying an emergency radio you should also check what power options it offers. Some good radios come with multiple options for charging the batteries. Not only should you look for a radio with a decent battery life, but it also should have different ways to charge. You need a radio with an AC adapter so you can keep it powered on an average day. But what would you do when power is out? At times like this radios that have solar panels or a hand crank radio can prove to be very convenient. With a solar panel and a hand cranking option you can even listen to warnings and alerts when power has been down for days. Some of the best hand crank radios also come with extra battery packs. This can actually save your life, so make sure you consider the power options when buying a radio. All the points we covered above are essential in a good radio, but if you are looking for some additional features then read on as we discuss what other specs could prove to be useful. One amazing feature to have in an emergency radio is the Specific Area Message Encoding (SAME). This feature provides you with warnings and alerts that are specific only to the area you are in and will prevent warnings that do not affect you from being broadcasted on your radio. The SAME feature makes sure that you don’t have to keep a close ear on the alerts from all over the world hoping to hear something about your location. Not only this saves time, but also saves power. Some other features that emergency radios can have are LED lights, water resistance and an alarm clock. Water resistance is particularly useful if you live in an area that receives a lot of rainfall. If you are concerned about your radio being affected by dust, then you should look for a radio that has dust resistance. The LED lights not only work as an emergency signal but can also work as a torch when the power is out. Some emergency survival radios also have a Morse code flashlight that can help you signal for help. Another good feature you can look for is ports to charge smartphones and other small electronic devices. This can come in very handy when the power is out and you need to charge your phone. There are radios that allow you to listen to music and other channels and also have headphone jacks so you can privately listen to whatever’s playing. While there are several amazing emergency radios available in the market, some brands are known for producing high quality products and most people around the world invest in their products. Some of these brands are discussed in this section. One of the most famous brands in the world of emergency radios is Eton. The company’s goal is to produce high quality radios that not only provide people with news and alerts, but also keep them entertained on the go. The award winning American Red Cross emergency radio from Eton are known all over the world for their particularly beneficial features. Most of their radios not only have several power options but they also come with extra battery packs. With an Eton emergency radio you can stay connected with the world at all times, no matter what disaster hits your area or where you are located. Whether you need a radio for a backpacking trip or want to use it for entertainment in your own room, the Eton radios would always be there you. You can play music or hear alerts, with an Eton radio at your side you can do anything you want. Another name trusted all over the world for producing superior quality radios is Sangean. The company has been operating for several decades and has established it's place in the market. Sangean not only produces radios but a variety of other electronic devices as well, which are all being used around the globe. Sangean radios are not only great for providing you timely alerts in case of emergencies but they also have several other features that are perfect for everyday use. Sangean radios are reliable and long lasting and they also come with a pretty good warranty. The company’s policy of putting quality above everything else, combined with their promise of satisfying their customers has made Sangean a big name in the world of electronic devices over the years. So if you are looking for a good hand crank radio, do check out Sangean products like the Sangean ﻿﻿MMR﻿﻿-88, you will not be disappointed. For people considering what emergency radio to buy, another great option are radios from Midland. The brand is among the most popular companies that produce electronic devices such as weather radios, hand crank radios and walkie-talkies. The company has been in the business for decades and knows what kinds of products the consumer wants. So no matter what Midland model you buy, you will be surprised with all the incredible features it comes with. Midland radios take your safety very seriously. So whether you need it for alerts, or want a flashlight, or a charger for your phone, a single Midland radio can fulfill all your requirements. What’s more is that you can use these radios for entertainment as well and enjoy listening to music or programs from various channels. So if you are still confused what radio would be perfect for you, then put your trust in Midland and get yourself an amazing radio such as the Midland ER310 right away. If you are looking for a radio that is reliable and will keep you covered during times of crisis, then you should definitely check out Kaito emergency radios. Whether you are trying to escape a tornado, or trapped in your house due to a disaster, or if you are going on a long camping trip, a Kaito radio can help you through it all. Kaito radios have multiple power options, a good battery and several other features that can prove to be very useful when the power is out. Some of their radios even let you charge your phone or other small electronic devices and feature flashlights and LED lamps to help you in poorly lit conditions. There are numerous Kaito radio models available, such as the excellent Kaito KA500, so you can easily find the one that fits all your requirements. A Kaito radio can keep you and your family safe and entertained and you definitely won't regret investing in one of them. With so many options available, buying the perfect emergency radio can be pretty tough. But with the help of this guide, you now know what features you need to look for in a good radio for emergencies and what brands produce the best radios. Any decent radio should be good for both daily use and in times of crisis. All you need to do is to look for a radio that has all the features you find useful. With the perfect radio at your side, you can not only survive a disaster but also keep yourself entertained while you are traveling. So take action now and buy yourself a good emergency radio!